UPDATED, SPACIOUS, PRISTINE HOME IN DESIRABLE BERLIN BORO-TRULY TURN KEY!! The Moment You Step Into This Meticulous and Beautiful Home Youll Notice the Striking Custom Woodwork Throughout! NEW CENTRAL AIR JUST 1 YR.OLD!! 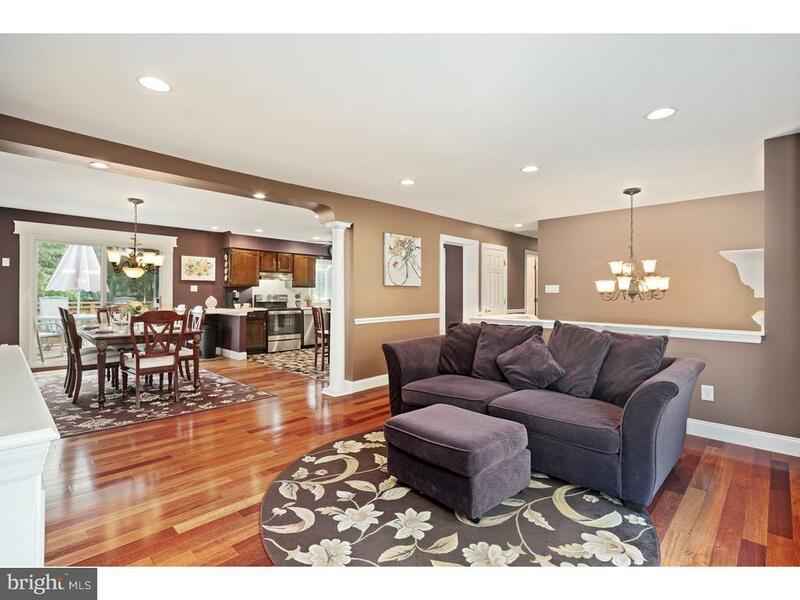 The Open Concept Main Floor has Gorgeous, Gleaming 3/4" Brazilian Cherry Hardwood Throughout the Living and Dining Rooms! The Living Room Has a Custom Built In Entertainment Center and a Huge Bay Window with Amazing Decorative Over Sized Window Casings. This Flows Into the Spacious Dining Room with Pretty Chandelier and Double Sliders Leading to the Large Second Story Deck for Seamless Entertaining! The Dining Room is Fully Open to The Large Eat In Kitchen with Full Stainless Steel Appliance Package, Double Stainless Sink, Bright Garden Window for Growing Herbs, Lots of Counter Space, Plentiful Dark Wood Cabinets, Pantry, Recessed Niche and Ceiling Fan! Pottery Barn Colors and 5 1/4" Baseboards Throughout This Lovely Home! Down the Pretty Hallway with Its Shadow Box Wall Trim Youll Find the Spacious, Light and Airy Master Bedroom with 6" Crown Molding, Large Bay Window and Expansive Double Closet with Custom Organizers! The GORGEOUS, UPDATED ADJOINING FULL BATH Has a Deep Jetted Tub with Window for Light and Shutters for Privacy! A Spacious Shower, Dark Wood Vanity with Plenty of Storage, Matching Mirror and Wall Cabinet and a Shining, Neutral, Marble Floor Combine to Make This a Stunning Bathroom! The Second and Third Bedroom are Nice Sized with Double Closets! Step Downstairs to Huge Family Room with Wood Burning Fireplace Surrounded by Custom Woodwork, Built In Cabinetry, NEW BERBER CARPET, Bar for Entertaining and Double Sliders To Extra Large Patio Area. Pretty Full Bath with White Cabinetry and Ceramic Tile Floor on This Level, as Well as a Nice Size and Private Fourth Bedroom Giving This Home IN-LAW SUITE POTENTIAL or Lovely Accommodations for Overnight Guests!! Deep Closet in Hall with Small Door to Additional Storage Under the Stairs! Spacious Laundry Room/Mud Room with Large Shelved Pantry Closet has Access to Walled and Insulated Garage! NEWER WASHER/DRYER-INCLUDED! The Family Room and Outdoor Patio Are Wired For Sound! Furnace Has Had Many Upgrades! Light Switches with LED Dimmers Throughout! Attic with Pull Down Stairs-Even More Storage! Outside Youll Find an ENORMOUS FULLY FENCED BACKYARD with Multiple Patio Areas, Underground Sprinkler System and Gorgeous Landscaping Throughout This Property! One Year Home Warranty! Directions: Cross Keys Rd. to Constitution to Wayside to Brierhill Rd. Please put address as 9 Briarhill Rd In GPS though street sign will say Brierhill.